Pam Baker's "Something From Eddie: Getting to know Eddie Livingston" is a memoir of an extraordinary American veteran who fought for everything he believed in, particularly regarding veteran health care, until his last days. Eddie was a WW2 veteran who was determined to be physically and mentally unfit for continuing his service after multiple battles. Unfortunately, rather than receiving the health care resources he needs, Eddie was subjected to obstacle after obstacle in pursuit of care. Although it is sad to read about how Eddie had to suffer under the system's shortcomings, it is incredibly motivating to read about his determination. He was admirably resilient and was a vocal advocate for veterans' issues. 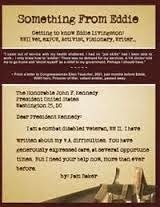 The book includes some scans of some of Eddie's original letters to politicians, which are interesting to see firsthand. Reading this book in light of recent scandals in veteran health care has shown me that Eddie's work is far from done. Overall, this is a book that will inspire you to stand up for what you believe.